Sen. Rand Paul, R-KY., won this year's Conservative Political Action Conference straw poll. 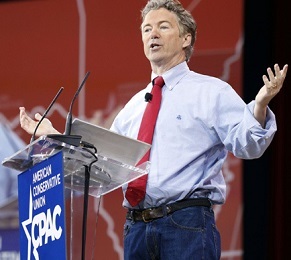 His father Ron Paul won the CPAC straw vote in two previous years; and Rand also won in 2013. Ben Carson: Don't let the PC police label conservatives as extremists. Carly Fiorina: I don't just Tweet about equal pay; I lead on pay standards. Rand Paul: Defend the 4th & 5th Amendments against Big Government. Ted Cruz: I disagree with states legalizing pot, but it's their right. Rand Paul: End hypocrisy and over-criminalization of marijuana. Scott Walker: Opposes Colorado's legalization of marijuana. Ted Cruz: Let states be laboratories of democracy on marijuana. Jeb Bush: Federal government should create choices, not standards. Ben Carson: Private schooling better than Common Core public schooling. Carly Fiorina: I know the leaders of the Mideast; Obama & Hillary do not. Marco Rubio: I have a clear strategic vision of America's role in world. Marco Rubio: Obama has no ISIS policy to avoid upsetting Iran. Carly Fiorina: Advised CIA on Russian affairs after 2007. Carly Fiorina: Hillary shouldn't accept foreign money in her PAC. Sarah Palin: Vouchers for veterans' health care outside the VA system. Ted Cruz: Washington wants ObamaCare, the people want liberty. Ben Carson: Shia-led Iran is more dangerous than ISIL. Gary Johnson: Government transparency on 9/11 secret reports. Mike Pence: The time has come to dramatically increase defense spending. Sarah Palin: Let veterans apply skills to skip state certification. Rand Paul: Kids are concerned with privacy & the surveillance state. Sarah Palin: Dozens of veterans per day commit suicide; VA should help. Scott Walker: Build up U.S. military to take out ISIS entirely. Scott Walker: Ensure against radical Islamic terrorism on American soil. Marco Rubio: Deal with border & future immigrants BEFORE any amnesty. Scott Walker: No amnesty; close the back door & enforce the law. Scott Walker: Right-to-work rules stand up for the hardworking taxpayers. Sharron Angle: Hosts Conservative Commandos: "Believe in the Constitution". Chris Christie: Sometimes must tell constituents to sit down & shut up. Ted Cruz: I'm despised by GOP establishment, but so was Reagan. Carly Fiorina: Started "Unlock Your Potential PAC" in 2014. Rand Paul: Balanced budget and a simple, fair tax system. Ted Cruz: Abolish the IRS. Ben Carson: Untie the military's hands; let them destroy ISIS. Marco Rubio: ISIS plan: US air support for Sunni forces on the ground. Sarah Palin: Yes, we can kill our way to victory in the Mideast. Joni Ernst: Cohesive and strong strategy to confront threats. The above quotations are from Speeches to Conservative Political Action Conference, Feb. 26-27, 2015.